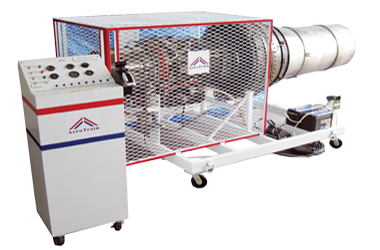 Model AE-33-700 is a runnable GE CF700 low bypass turbofan engine mounted on a mobile test stand with anchoring points. The engine can be operated with the help of a control console and instruments panel. The trainer is supplied with all associated systems, instruments,and accessories that are needed for its operation. A safety barrier protects the engine intake area to avoid any accidents. The runnable engine can be operated like it is operated on the aircraft during the ground runs over its operating range of rpm as specified by the engine manufacturer for ground operations. The runnable engine stand is mounted on casters which allows mobility for easy positioning of the engine.However, the stand must be securely attached to anchoring points prior to operation. Engine ignition and starting system is included, as well as the oil, fuel and electrical system are representative of typical aircraft systems. The control panel is connected to the engine and associated systems by a 20 foot long umbilical cord, to allow the operator to run the engine safely. An optional Data Acquisition System may be included which will record the engine parameters during the engine run, and then may be used (in graphical form or tabulated format) for understanding the relationship between various interdependent engine variables.